troubled water McCarthy's road-trip comedy starts off promisingly but runs out of gas fast. I'm still shaking off the shock, but there's no getting around it: This is a road movie in which Melissa McCarthy — one of the planet's funniest people — takes her audience down a dead end. That's something you'd never guess from the film's opening, which is pure spit-out-your-Pepsi genius: McCarthy's character, is late for work. A deer smashed into her car, and she stopped to administer mouth-to-mouth. Tammy is employed at a fast-food joint where the manager is played by the actress' husband, Ben Falcone. He fires her, and she pitches an epic fit, spitting on her hands and defiling every burger in the place on her way out. "Enjoy the special sauce!" are Tammy's last words before heading home to find her husband in the act of being unfaithful. It isn't noon yet, and she's lost her car, her job and her man. If that isn't a setup for Melissa McCarthy-brand wackiness, I don't know what is. The people who made Tammy didn't know, either. Which is weird, because it's the first movie made entirely by McCarthy and Falcone themselves. The two wrote it; he directs and she stars. It's like the universe said, "You guys are great. Here's a check. Go do what you do!" Karma rarely gets things so right. Which is why it's such a perplexing shame that the pair proceeded to get them so wrong. Tammy hits the road with the only person she knows who possesses a car and a roll of cash. That would be her Oxy-popping grandmother, Pearl, played by Susan Sarandon under prosthetics and one really unfortunate wig. We learn that Pearl has always wanted to see Niagara Falls, and we're expected to bust a gut when the gals accidentally wind up in Missouri instead. The Grammy-Tammy shtick gets old fast. Essentially, the two take turns "defying expectations." Tammy is not conventionally attractive, for example, but bets she can pick up a bunch of studs in a bar. Pearl looks like someone in an "I've fallen and I can't get up" commercial, but she engages in sexual acrobatics with a total stranger. The movie is mildly amusing in places (McCarthy plus jet-ski equals laughs; that's just science), but it's never as unpredictable as fans have reason to expect. I think I know why. McCarthy is great at two things. As a supporting player, she's one of the titans of improv. Watch her outtakes from This Is 40. They're funnier than anything in the film. McCarthy is also the best there is at playing off a straight costar, as she did with Sandra Bullock in The Heat and Jason Bateman in Identity Thief. 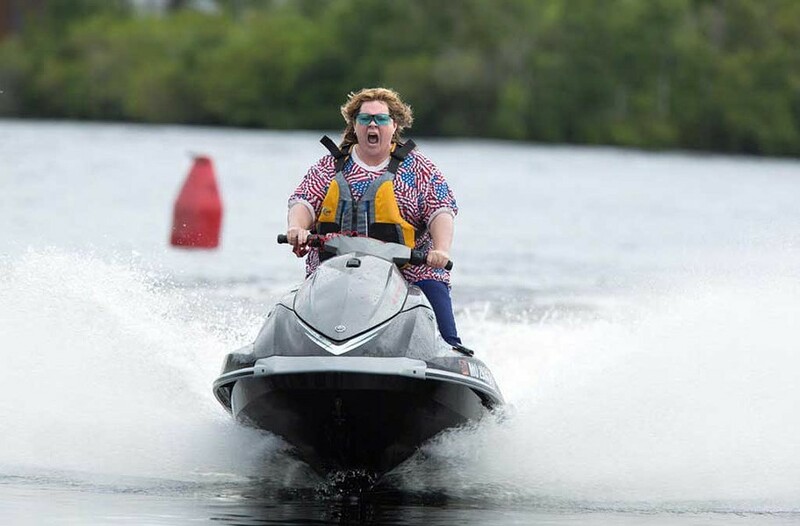 The problem in Tammy is that, while it may appear initially that she's playing off a straight foil, she's actually playing off a geriatric version of herself. Sarandon's character may look like a suburban senior on the outside, but inside she's every bit the id-on-wheels her granddaughter is. What McCarthy is not adept at, thank the Lord, is carrying a picture traditionally. That entails portraying a character who learns life lessons and, ho-hum, comes out the other end a better person, as Tammy does. The actor has done amazing work over the past three years, and it's earned her some big-time breaks. Not only did Warner Bros. give her and Falcone carte blanche, but she got to work with comic royalty: people like Dan Aykroyd — who literally was not given one wild or crazy thing to do — and Will Ferrell, whose Gary Sanchez Productions lent the film its stamp of approval. Ferrell's involvement offers useful context. It's possible to think of Tammy as a longer, more elaborate version of the sort of celebrity video you might see on the comedian's popular voting site Funny or Die.